Philip Stockton lets Martha Berry know that, through the will of the late Ellen Mason, she will be receiving a nice donation. 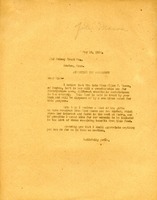 Letter from Martha Berry to Old Colony Trust Co.
Martha Berry contacts the president of the Old Colony Trust Co. in regards to the will left behind by Miss Ellen Mason. She asks for the Berry Schools to be added to the list of charitable beneficiaries that will receive funds from the will.